TO ENTER MY BLOG CANDY PLEASE CLICK HERE! If you are here to enter my Blog Candy Drawing, please click HERE. Today...I wanted to share a project I have been working on. I bought this lovely acrylic tissue box from Hobby Lobby. It retails for $9.99 but with the 40% off coupon you can get it for only $6.00. It is sturdy and really a beautiful design. There are so many possibilities for it! 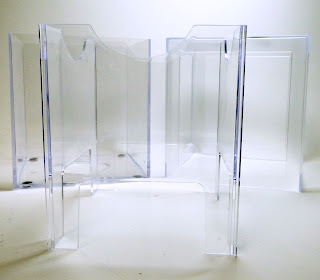 I originally was going to make a 4 seasons box, using one season for each side, but decided to make all 4 sides for one season and change the entire box up every season. It's as easy as making 4 cards! 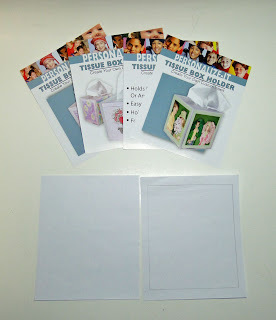 First, you will want to make an insert for the top of the tissue box so you won't be looking at the cardboard tissue box, but a pretty coordinating paper. 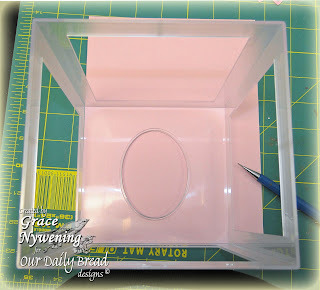 To do this I simply took the top of the box, laid it on my card stock and drew the pattern. 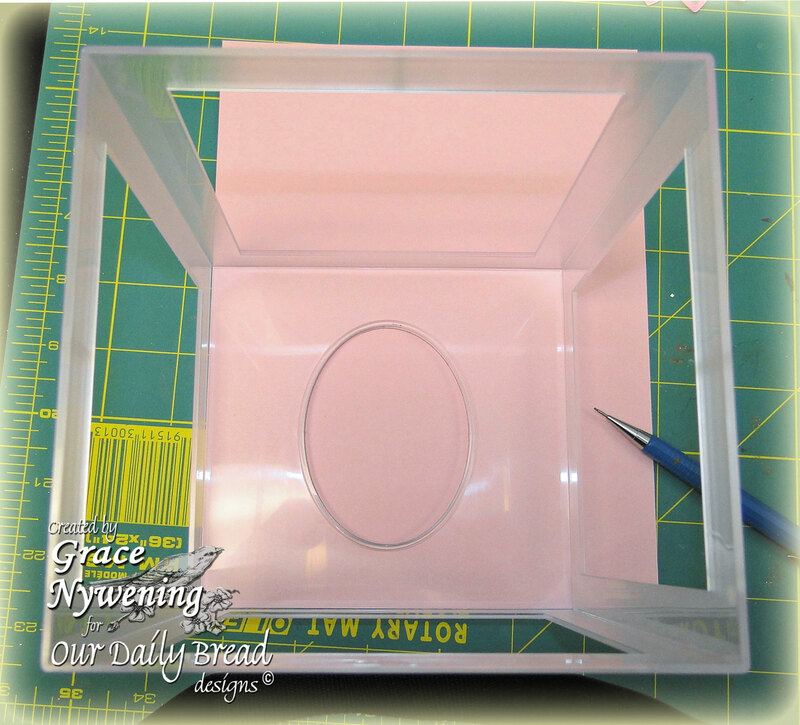 I then found a Classic Oval Spellbinders die that fit that cut out about perfectly, centered that and cut it out. This is how it looks in the box. Next I used my template sizes to create my four springy sides. I used a couple brand new ODBD sets, and a couple favorite past release sets. 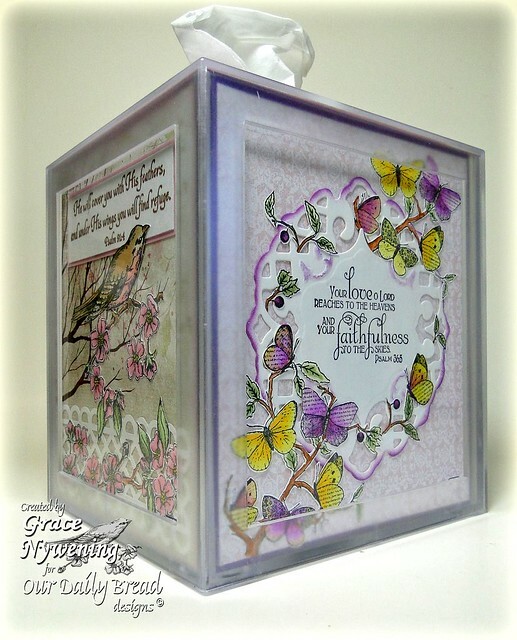 For my first side, I used this month's release "Butterfly Corner" and a sentiment from the "Faith" set, as well as the "Small Butterfly Background" stamp. I colored the Butterfly corner design with Copics (Y13, Y15, Y17, V09, V15, V17). Next I lightly airbrushed the background using V000, V12, B00 and Y11. 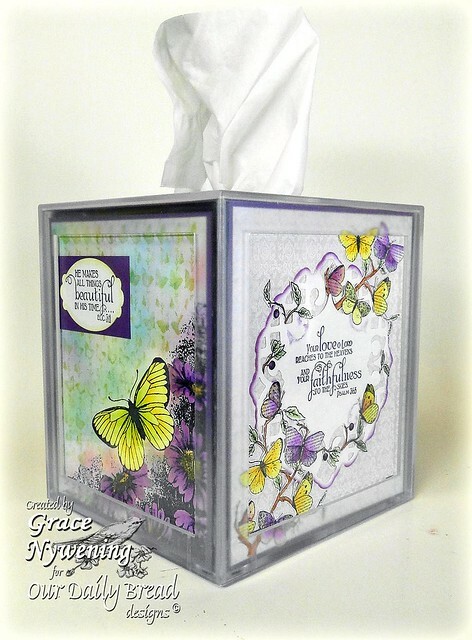 I then made a mask of the corner and stamped the Small Butterfly Background with VersaColor White. I lightly brushed the design with yellow and green Pearlescent Chalks by Pebbles. I then spritzed the entire thing with Pearl Glimmer Mist. Wish you could see the shimmer! This "set" the chalks as well. I stamped my sentiment and cut it out with Spellbinders Label 10, matted with my purple cs (EK Success Purple Helliotrop) and matted the whole panel in the same purple. Side 1 was done and I was ready to start side 2. For side 2 I used this month's release "Faith" for both my verse and my butterflies. I stamped the butterfly design twice, colored with Copics (Y13, Y15, Y17, G20, G82, E35, E37, E15, V04, V06, V12). I fussy cut the butterflies out so that I could lace them into my Spellbinder's Lattice Pendant cut out, which I had sponged with VersaMagic Purple Hydrangea. I adhered everything to the same designer paper as side 1 and matted with the same purple cs. 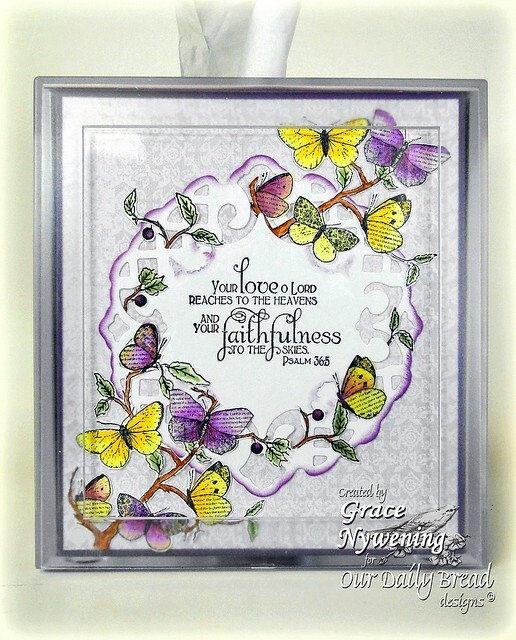 For my third side I used the Fuchsia images from both "From Me To You" and "God Loves You" sets, stamping on pure white and stamping an extra image for cutting out and popping up. I colored my image with Copics: RV06, RV09, RV11, RV17, RV19, V15, V17, G20, G21, YG67, G24. 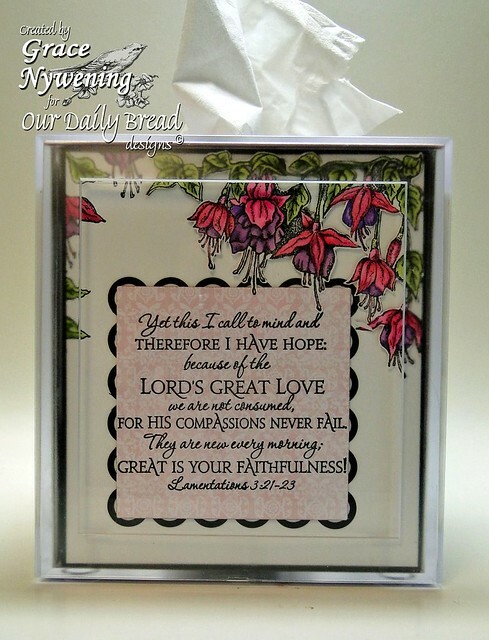 I used the same purple cs as my mat for the panel, and I used this wonderful Lamentations 3:21-13 Scripture from the "Scripture Collection 1" set for my focal point. This is one of my favorite Scriptures and I wanted to see this every morning as a reminder of God's Faithfulness and His great mercies for me... and how they are new every morning! 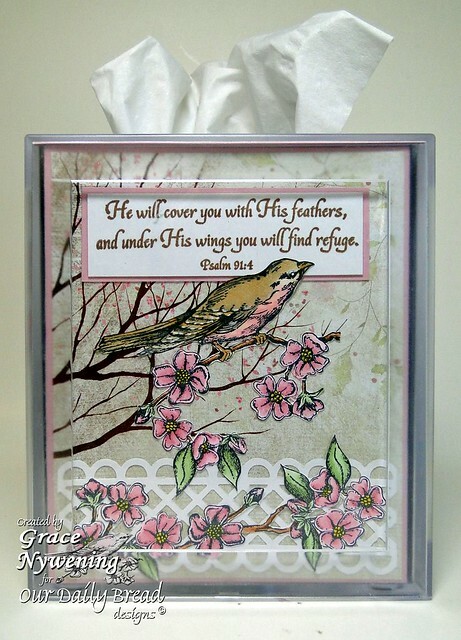 I stamped this verse directly on the Memory Box Gossamer designer paper and cut with Spellbinders Classic Squares. I matted in black using Spellbinders Lacey Squares. For my last panel, I used an all time favorite, "Sing to the Lord" for my bird and flower images. For my verse I used "You Will Find Refuge". This again is a favorite Scripture of mine! I can't tell you how many times this verse comes to my mind when life's storms seem to surround and encompass me! The designer paper is Memory Box, the cs is Martha Stewart. I colored with Copics: R81, R83, R85, R000, RV10. E15, E35, E37, E31, W3, W5, G40. G82. I also highlighted with Spica Clear and Yellow Glitter Pens. I used a Martha Stewart Lattic Punch and cut some extra flower images out to weave into the lattice. Finally, you insert a tissue box, and then slide the outter frame over top of the whole thing and you have a beautiful gift or something you will keep and enjoy yourself! In making this I used the 11 elements challenge from Shabby Tearoom. They are Acrylic Box, Designer Paper, Copics, MS Punch, Glimmer Mist, Chalks, SB Label 10, SB Lattice Pendant, SB Lacey Circle, Card Stock, Scissors for hand cut work. I have already started the panels for a Winter Tissue Box Cover, and have plans for a fall one as well! I hope you are inspired to try one for yourself and have fun with it! Thanks so much for stopping by! Good Morning Grace, this is sooooooo beautiful WOW lots of beautiful images and I LOVE your color combo..You did such an amazing job on this project!! Absolutely GORGEOUS sweetie!! Have a wonderful day!!! Thank you for sharing a beautiful project. Love the colors and everything about it. What great gifts these will make. Oh Grace, this is stunning through and through!! I know we have talked about it and I have seen some photos but none of our conversations do this justice. It is over the top!! I love every detail!! You are so incredibly talented and creative my friend!! what a beautiful work of art . The images and sentiments are just wonderful. Oh my word that's gorgeous Grace. So much work but what a beautiful gift for someone or to spoil yourself. Happy new year and every blessing. Grace... this is spectacular!! I love that you included your favorite Bible verses on each side and the way you framed them and embellished around them are just stunning! Thanks for taking on our quote challenge at Frosted Designs this week! This is stunning, so much gorgeous work! Girl-This is just FABULOUS! Love the gorgeous colors and coloring. Thank you for playing with Speedy's Friends. Love it!! Such a great creation! That is a beautiful project. Thanks for sharing this great idea with us. Thanks for joining LCI's challenge! So beautiful and very useful. Thanks for playing along at LCI this week. This is just incredible! Your art on each side is just amazing! The colors, the Scriptures...so you see them first thing in the morning...wonderful! I can't imagine which side I would display as the front. It would be an impossible decision. You used such amazing images and Verses. This would be a wonderful and light weight Holiday or Birthday gift for your loved ones. It would be so personal, and useable! I wonder if you need to laminate it, so they don't get drops of water into the container? I know this would make an Amazing gift to anyone! You could sell these for quite a bit! I LOVE the way this project came out, can you tell!??! Thank you so much for breaking it all down for us. I read it on the ODBD blog, but the photos here really do it more justice...it is worth the space on the blog to do larger photos on the ODBD blog, imo. Wow- that is just gorgeous. Brilliant idea!! What a fabulous box!! Thanks for playing with Speedy's Friends! WOW fabulous project, beautifully done! TFS your pictures are so nice & clear. I do love this sweet box. I may just have to go to HL. You did a beautiful job on this and what a lovely gift. Thanks for joining us at Victorine Originals this week! Grace, you have out done yourself! This is over the top, GF! So many beautiful details! 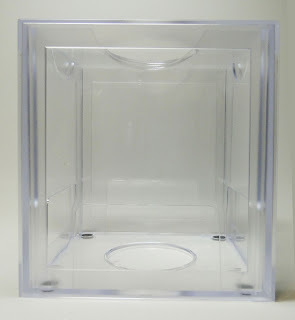 I think I might have to invest in one of these acrylic boxes! Would make a beautiful gift! Gorgeous! Thanks for sharing! Wow, this is stunning! Thanks for posting the tutorial! Thanks for joining us at Tuesday Throwdown! We hope to see you again next week! Oh my! This is one jaw-dropping piece of artwork! Gorgeous! WOW! Grace your creation is stunning! I love all the details and you know I love to alter stuffs too. Thanks for the inspirations! You did a fabulous job. Thanks for sharing with us at the Whoopsi Daisy. Hope to see you again next week challenge. Beyond gorgeous as ever, Grace! I've been wanting to make one of this. 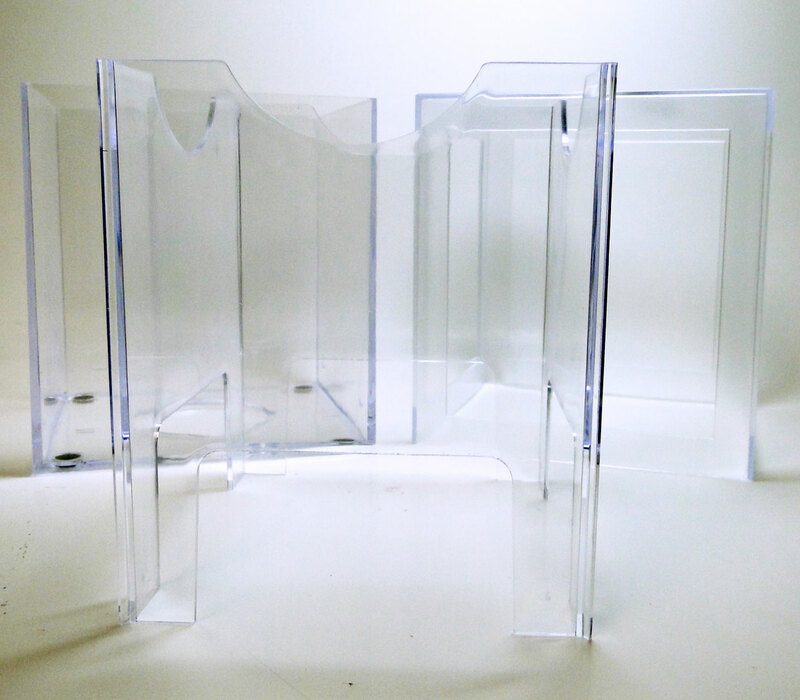 Glad for the source on the acrylic goods. I would like to invite you to a blog hop I"m hosting. Great group, wonderful projects and yummy BLOG CANDY! This is absolutely stunning, Grace! What a creative and gorgeous project! Every detail is perfect and your coloring is outstanding! Thanks for sharing all the details of how you made it! Hugs! That is absolutely stunning! Thank you so much for joining us at Quirky Crafts. Your work is stunning! I absolutely love this project. You are so talented. Grace, this is such a beautiful project!! I love all the scriptures you've chosen, and each side is a work of art! My parents have been in a nursing home since October...I think this would be a real spirit-lifter with the scripture. Thank you for sharing your unique, beautiful, and practical project! 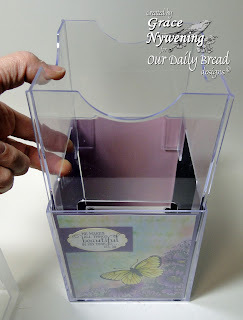 Thx for sharing with us at Ladybug Crafts Ink! I hope to see more of your creativity at our next challenge!! I don't know where to start...I think this is one of the nicest creations I have seen. I am so glad I have the Faith set on the way to my home here in Australia. Seeing how the butterfly branch has been colored so beautifully I can't wait to do it too. I don't know if it will look as beautiful as yours though. This is a stunning work of art. Have a wonderful blessed New Year. This is really incredible Grace..I love the way you created each side differently. I look forward to seeing it each season.. Great job..See you soon. Wow! Just beautiful! Thanks for joining us at Kaboodle Doodles this week! 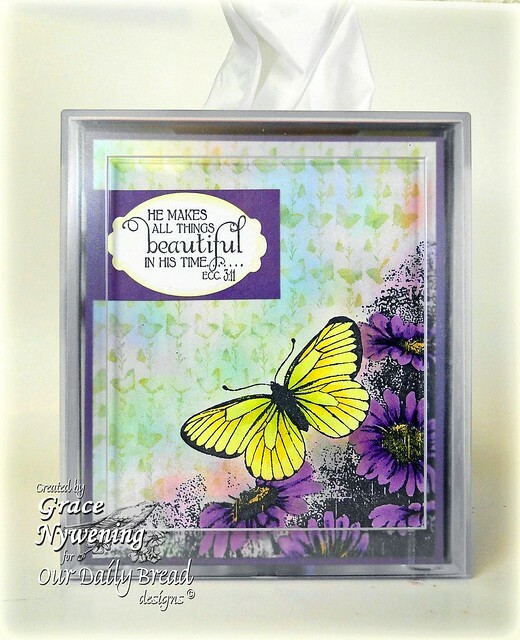 Gorgeous tissue box Grace!! If I cry, will you send it to me?? teehee. oh wow! this is absolutely fabulous! 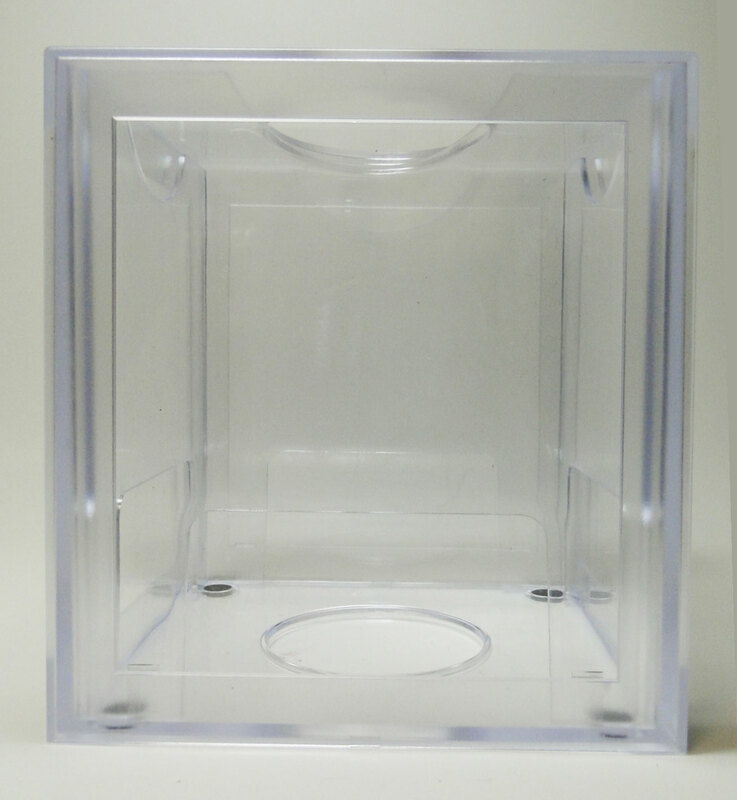 Every side of the box is perfect and thanks for the instructions and tips! 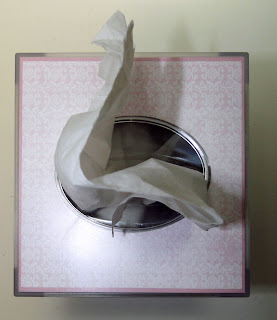 Beautiful tissue box. Thanks for sharing with us at Craft Your Passion. This is absolutely stunning Grace. I love it. You have done such a beautiful job with your stamping and colouring. Fantastic project, love your blog. How fantastic is this! I wish we had a Hobby Lobby here. Just love it. Thanks for joining us at The Pixie Cottage this week! Thank you so much Grace for participating in our first blog hop for Puttin' on the Glitz! We appreciate your comments so much! Winners will be announced on my blog Monday! Wishing you the best! Wow - what a great card for the Corrosive Challenge. Thanks for joining us! I'm at a loss for words - this is just stunning! Love, Love, Love everything!!! Oh wow Grace what a gorgeous piece of art who would have thought a box of tissues could be so beautiful thanks so much for sharing your project with us at Whoopsi Daisy this week. You can see all the dedication and time that went into this. Thank you for playing with The Pixie Cottage this week. WOW! What an amazing project. You must have spent ages on this but it really is worth it. Thanks for the inspiration. It's time to vote for your favourite card and get all your blogging buddies to vote for you!! So hop over to Quirky Craft's! and vote! !